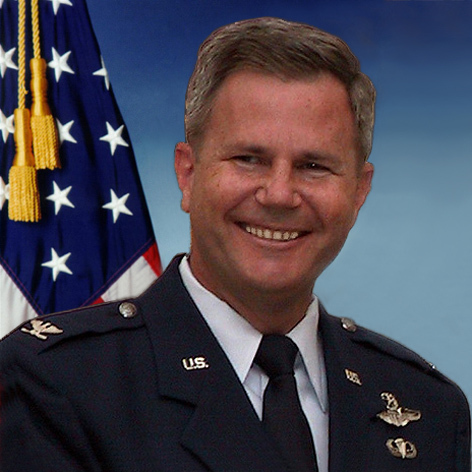 Colonel Joseph Niemeyer is a 1977 graduate of the U.S. Air Force Academy. In his first flying assignment at Norton AFB, he served as a planner for the Primary Nuclear Airlift Force and as squadron Chief of Standardization. At Headquarters, Air Mobility Command, he was responsible for projects ranging from airlift survivability to aircrew scheduling. On returning to flying, he led a C-141 formation in the initial airborne assault of Operation JUST CAUSE in Panama and during Operations DESERT SHIELD and DESERT STORM in Southwest Asia. He was selected for the C‑17 initial cadre and later commanded the C-17 operational test squadron at Edwards AFB. Colonel Niemeyer served in the Office of the Secretary of Defense at the Pentagon, followed by a tour as Deputy Commander of the 62nd Operations Group at McChord AFB, and finally as Chief of the Office of Defense Cooperation (ODC) at the American Embassy in London, UK. During his flying career he served as instructor and flight examiner in both the C‑141 Starlifter and C‑17 Globemaster III. He is a Command Pilot with more than 5,000 flight hours. Colonel Niemeyer retired from active duty on November 1, 2003 after more than 26 years of service.